Raw feeding dogs and biologically appropriate raw foods have boomed over the last decades in dog circles. The reasons why are very simple: feeding dogs raw food means you know exactly what they are eating without added chemicals, preservatives, or denatured nutrients. Additionally, the proteins, fatty acids, and carbohydrates are bioavailable and much healthier than kibble. Over the last couple of decades, the pet food industry did not help itself with huge numbers of recalls and withdrawals even amongst the top dog food brands! Make sure you watch the Netflix documentary Pet Fooled. Incredibly shocking behaviors from the industry. Pet parents and dog breeders got tired of these low-quality dog foods and started making their own; it’s actually not hard at all. When you make your own dog food and pick the right ingredients (meat, fish, vegetables, eggs, etc) you will find yourself in a dilemma. Should I feed my dog raw dog food or should I boil it? First and foremost, both homemade raw and boiled pet foods are a massive upgrade from commercial kibbles and cans. Boiling or cooking the ingredients helps killing undesirable bacterias but will also denature your food from some vitamins and nutrients. It really is a personal preference and both are just awesome so take your pick and ride with it! Feeding dogs raw is trying to mimic what would their diet be if they were in the wild, and humans offer some healthy adjustments such as adding more vegetables for example. Perfecting a raw dog diet is here to optimize the nutritional profile of each meal while diminishing potential risks. Raw feeding a dog is pretty much the most natural and instinctive way dogs enjoy food: it’s very tasty, it has high water content and contains no processed ingredients. 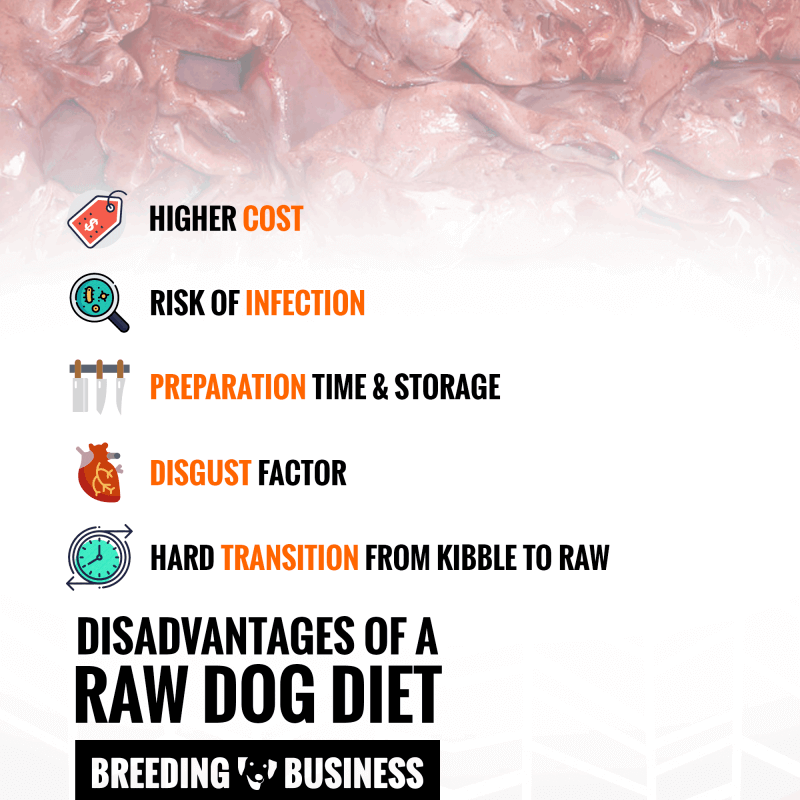 After a few weeks on a biologically appropriate raw diet, physical benefits will become observable but the best pros of a raw dog diet happen under the hood. Ideally, the dog owner wants to offer its dog a raw dog diet similar to what the wild would offer. From muscle meat, boney meat, to offals, as well as adding wholesome leafy greens and vegetables. In the same way that we know processed junk food is bad for our minds and bodies, your dog’s processed meals can also have similar consequences. Processed dog food generally provides a poorer standard of nutrition than all-natural provides because of the low protein and high salt, sugar, and chemical content. These factors, especially when combined, will often impact negatively on your dog’s health over time. 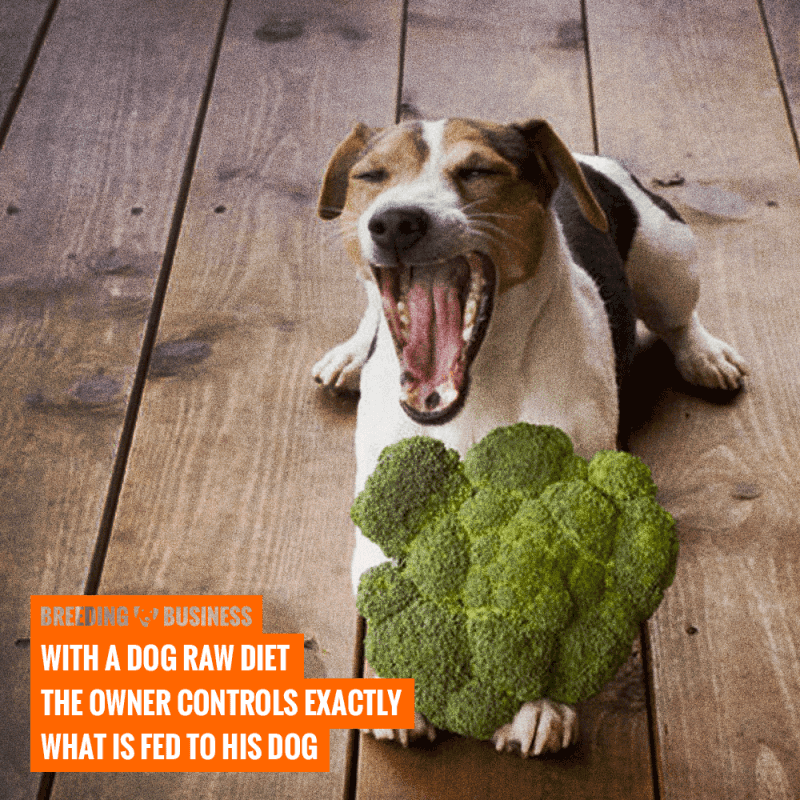 Sometimes it’s difficult to notice these negative effects until trying an alternative diet, such as the raw food dog diet, reveals eye-opening results. The fact that processed dog food is cooked at high temperatures can also impact on its quality as many of the beneficial enzymes present in raw food are killed off during the cooking process, altering its structure. These enzymes are key components in many of your dog’s metabolic processes and without them, your dog’s body will have to work harder to digest its food, which can lead to a whole host of problems (digestive troubles being the most obvious). We all know that animals in the wild do not cook their food, so to many, it is a mystery why some dog owners feel the need to cook an evening meal for their dog or agonize over which dog food brand will provide their dog with the best nutrients. Physiologically, dogs are equipped with all the right tools to successfully digest raw food such as the right bacteria-killing agents and stomach acid. Dogs are carnivores; therefore, the most important part of their diet is meat and all its components; muscle, fatty tissue, bones, and organs. A diet high in grains, fruit, and vegetables is perfectly nutritious for herbivores and omnivores, however, dogs will not reap the same benefits as they digest them far too quickly to absorb sufficient nutrients. This fast digestion can also cause high insulin and blood sugar levels, which can lead to diabetes and poor, erratic behavior. Make sure your dog’s raw diet is not too heavy on fruit, vegetables or grains and don’t be afraid to give your dog muscle meat still on the bone, or meaty organs such as kidney or liver. Organic vitamins — found in raw meat and vegetables and beneficial for overall health. Essential fatty acids — found in raw meat and helps your dog maintain a healthy coat and skin. Active enzymes — these are essential for important metabolic processes in dogs. High-quality protein — a further downside to processed dog foods is that even if they boast high protein levels, the quality of the protein tends to be poor, as meat offcuts unfit for human consumption are often used to keep manufacturing costs down. Perhaps one of the most obvious advantages of providing your dog with a raw food diet is that you know exactly what your dogs are ingesting. There are no hidden chemicals, such as additives or preservatives, that may be doing your dog more harm than good. Feeding your dog raw food is probably the quickest and easiest way to ensure you know about every ingredient that is passing through your dog’s stomach and with this comes peace of mind. You can ensure your dog has only the best! If your dog ever becomes unwell on a raw-fed diet you will not have to agonize over a long list of ingredients trying to work out what they are and whether they may be the cause. When you are trying to find the right food for your dog, you will also spend less time using trial and error to find products that agree with your dog. With a raw food diet, what you see is what you get and as long as the food is safely stored and prepared it is unlikely that your dog will experience any health-related issues as a consequence of diet once the transition period has passed. You can also adjust your dog’s raw food diet accordingly, for example, giving your dog a raw egg or two to boost their protein levels. However, eggs are rich so you should only feed them to your dog occasionally, perhaps after a particularly long day of walking. One of the best upsides of feeding your dog a homemade raw diet is that you have complete control over the list of ingredients. Probably one of the most aesthetically pleasing and noticeable improvements to your dog will be reflected in his coat, which should begin to look shinier and much healthier. A raw dog food diet is said to have the right balance between fresh protein and fat to encourage a silky coat. It is reported that 40% of a dog’s total protein consumption is used in optimizing the condition of their skin and coat. Expect a drastically reduced itch and skin allergies once you transition to a BARF diet. Dogs who are fed a high carb, low protein and low essential fatty acid diet will not have enough available nutrients, so their fur may look duller and this may be an indicator of poor overall health. In other words, how your dog is looking on the outside, should tell you a lot about the state of your dog inside. A dog’s skin and coat are great indicators so keep an eye on them! Something that many dog owners will have noticed after switching their dog to a raw diet is that their dog’s excrement is less smelly and much more compact — this will not matter so much to the dog, but it’s a small victory for the owner! Raw fed dog waste has no real odor as it consists largely of powdered bone. It also tends to be produced in smaller quantities than the stools of dogs who eat a processed dog food diet. This is due to a greater uptake of nutrients and water; your dog’s digestive system has not had to work so hard to rid itself of processed ingredients that it cannot use. When your dog eats a high-grain carbohydrate meal, the pH of his stomach is altered. Dogs who eat a raw diet typically have a low stomach pH which equals high acidity to aid digestion and maximize nutrient absorption, whereas a dog on a processed diet will have a high stomach pH and lower stomach acidity, making digestion more difficult. This also means that the food will almost all just pass straight through the dog giving them no great health benefits — this is also why their stools may look much bigger. Indeed, processed kibble and canned foods often contain a high percentage of fillers, ingredients that cut costs but offer no nutritional advantage… and these pass through the dog’s digestive system and end up in poop! If you need evidence that a raw diet is better for dogs’ teeth and gums, consider wolves and other wild dogs who tend to be free from dental infections and excessive tartar. They hunt and eat their prey in its raw form; shredding, ripping and crunching the flesh and bones of their prey which thoroughly cleans their teeth at the same time. Domestic dogs who are fed a diet of processed dog food are not given this opportunity. Their food is free from bones and is sold in chunky form resulting in these dogs having to do little or no work at all to chew and swallow their food. This sounds like a nice idea, as humans we no longer want to have to work hard for our food, but if your dog has foul breath and very yellow teeth (and you have even brushed or considered brushing your dog’s teeth) then the raw food diet may be the solution. Nevertheless, bones should be raw rather than cooked; this way they shouldn’t splinter when the dog chews them, reducing the risk of choking. Dogs also lack the enzyme amylase in their saliva, which means they cannot effectively break down carbohydrate sugars that enter their mouths. Processed dog food tends to contain varying levels of carbohydrate sugars which aid bacterial growth on the teeth and mouth when they cannot be broken down. This may lead to several dental problems for the dog including calculus, periodontal disease, plaque, gingivitis, and tartar. Dog owners who find themselves with a dog suffering from diet-related allergies may find these allergies come from grains or grain-fed meat. Grain allergies can lead to ear infections, red itchy skin, and discolored paws — you may also find that your dog is licking you a lot more than usual. Although grain is not outright harmful to dogs, it is not of high value to their metabolic processes and certain dogs have stomachs that are unable to tolerate it. This also explains the surge in grain-free dog foods currently available to dog owners! Additives and preservatives present in processed dog food, such as ethoxyquin, may also be harming your dog without you realizing. Ethoxyquin is also used as a pesticide and has been linked to liver and blood disorders in dogs. Experts warn that prolonged consumption of chemicals such as these can be toxic — a risk that is not present in a raw fed diet. A raw food diet has a higher water content which means that your dog is less likely to suffer from bloat. Research has shown that dogs who consume processed dog food are far more likely to suffer from bloat. Bloating in dogs occurs when the stomach fills with gas and then becomes twisted. This condition although mild in humans can be fatal for dogs and they can die within a few days or hours if it goes untreated. Although there is no solid evidence to prove that dry or processed food causes bloat there have been strong correlations made, so it is a risk that is best not to take. There are also high levels of salt in commercial dog foods and as a result, dogs drink excessive amounts of water to counteract it and have a much higher urine output. These high levels of salt can also contribute to kidney disease. There are no such things as free meals, even for our dogs! Raw feeding dogs also come with its own heap of risks, dangers, and disadvantages. They generally are not dealbreakers but you must be aware of these in order to diminish or remove them completely. Some of these cons about raw dog diets are just a matter inconvenience while others pertain to actual potential negative health consequences. 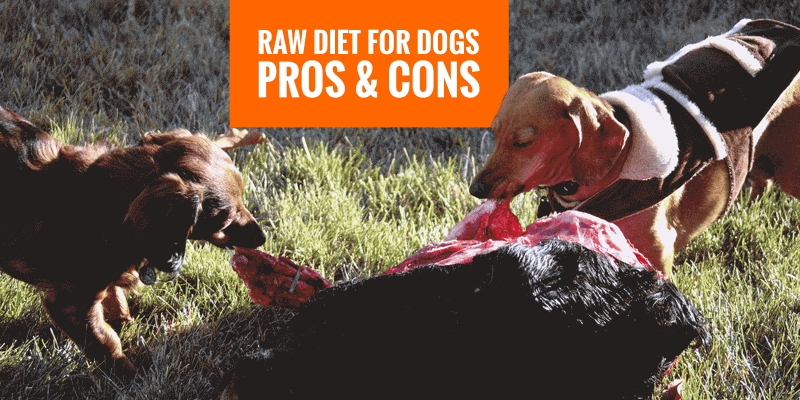 A raw dog diet is generally considered a huge upgrade from most commercial dog foods. However, there are a few disadvantages to feeding a dog raw food. Although it is, in fact, disadvantageous if your dog experiences problems when transitioning from a processed dog food diet to a raw dog food diet, once this settles down the benefits as discussed above, will be worth it. If your dog has been eating processed dog food for some time, they may initially be unsure of the “strange” new raw food you put in front of them. They may be choosy about the taste, texture, and consistency or they may feel anxious about eating this new food. It is important to persevere if you are serious about making the diet switch. Otherwise, your dog may learn that disregarding his food means he gets treated with the food he really wants, even though it may not be the healthier option. During the switch to raw food dogs may also experience diarrhoea, stomach cramps or gassiness while their digestive system adjusts. Some dog owners find it helps to add a small amount of yoghurt or goats milk to the meal to aid digestion as these will boost the good bacteria in your dog’s stomach. One to three tablespoons of yoghurt will be enough, or a small slither of cheese. Too much dairy can also upset a dog’s stomach so be sure to keep quantities small and monitor your dog to ensure that things are improving, rather than getting worse. Some dog owners may also want to try boiling the raw food for the first few days for a gentler transition. One of the disadvantages that dog owners may fear most when considering whether to make the switch to a raw dog food diet or not. Raw feeding comes with the risk of infections from bad bacteria such as Salmonella and Listeria which are most likely to be developed on raw meat. Not only do these bacteria pose a risk to dogs if ingested, but are even more dangerous if encountered by humans, especially those with weak immune systems. Although the risk of infection does exist, it is a small risk as dogs tend to have very strong stomachs and can handle bacteria a lot better than their owners can, especially if we consider their wild origins. There are a few precautions that can be taken to ensure that the risk of food poisoning to both you and your dog are minimized as much as possible. For example, washing up your dog bowl as soon as he has finished eating does not give any bacteria left behind time to develop and prevents contamination of the next meal. Always wash your hands before and after handling your dog’s raw food and consider purchasing color-coded chopping boards. This way, you can reserve a chopping board, especially for your dog’s raw meat, preventing cross-contamination. Always keep your dog’s raw meat in the fridge until it is time to serve it to your dog as not to allow bad bacteria to grow. Life gets busy and many dog owners may resent the time they have to spend preparing their dog’s raw dinner. Meat and vegetables must be cut up and time must be spent creating suitable portions, as raw meals are usually not in suitably-sized packets, unlike processed food. However, buying your dog’s raw food in bulk, cutting it up and putting portions into freezer bags can help you store your dog’s dinners weeks ahead. They can then be defrosted as and when needed. The downside to this mode of storage is that you may find yourself with less space to freeze your own dinners, but this is a small price to pay for a happier, healthier dog. If you are particularly squeamish, you might not enjoy watching your dog crunch his way through a load of chicken bones but the important thing to remember is that the benefits are immense. The sound may be disturbing to you but your dog’s teeth are benefiting with every crunch. You may also find the process of preparing your dog’s raw dinners quite messy, as well as the process of defrosting them, but so long as you are organized and thoroughly wash everything that has been in contact with raw meat, you should avoid any bacteria or bad smells in your home. It may also be an idea to keep the area where your dog eats consistent — perhaps a corner of a room that is out the way, or you may want to keep your dog in a crate whilst he eats if he’s a particularly messy eater. This way you confine any mess to one area, minimizing the amount of cleaning to be done when he is finished. If you have children, also take note of where they are while your dog is eating as it is important not to let them contaminate their hands with raw meat — if for any reason this does happen, wash their hands immediately. In the same way that healthy, organic human food is more expensive than processed high-carbohydrate junk food, a raw food dog diet is also going to cost more than picking up cans or packets of processed dog food at the supermarket or pet shop. Buying meat and vegetables in bulk from butchers or greengrocers may work out cheaper so it’s best to do your research ahead of your weekly food shop. Although your weekly shopping bill may increase, seeing the increased long-term health benefits for your dog will make it worth every penny! Sorry this is delayed, but don’t feed your dogs chicken bones, or any bones for that matter! Bones can get lodged in their digestive tract as a foreign body and will need surgery to remove. And smaller, sharper bones like from chickens may even pierce their esophagus or intestine, also requiring surgery to correct. In addition, tooth fractures and other periodontal lesions are common with bone chewing, and the more often you give your dogs bones, the higher risk they are at for any of these health issues. I know you may not have had any problems in the past, but they can happen at any time and you should protect your dog from these risks!